These cushion covers featured in the post that I wrote about our bedroom makeover recently, and I absolutely love them! 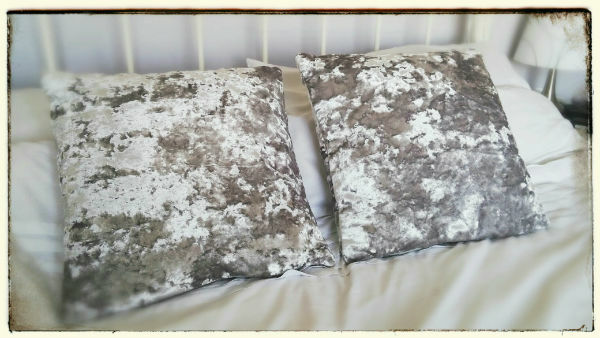 They are crushed velvet, and the mottled affect this produces is so pretty, and they add just a subtle amount of glitz and glamour to our beautiful grey and white room. They are, of course, from Dunelm Mill – I have bought so many cushion covers from there since we moved last year! 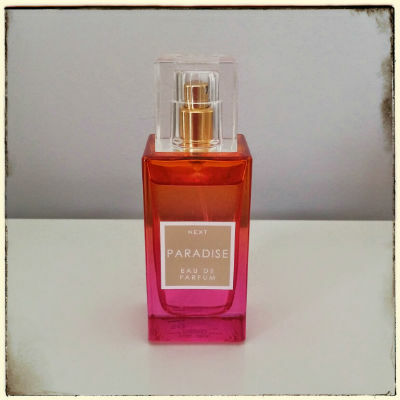 G and B bought me this gorgeous perfume from Next for my birthday – and they made a great choice! It has a fresh, fruity scent, which I always prefer, and it somehow reminds me of holidays in Grenada – always a good thing! Just look at the bottle, too – it’s just so pretty. I’m currently a little obsessed with glass bottle and jars, so I just had to buy this beautiful pale blue glass carafe when I saw it in Sainsburys a few weeks ago. 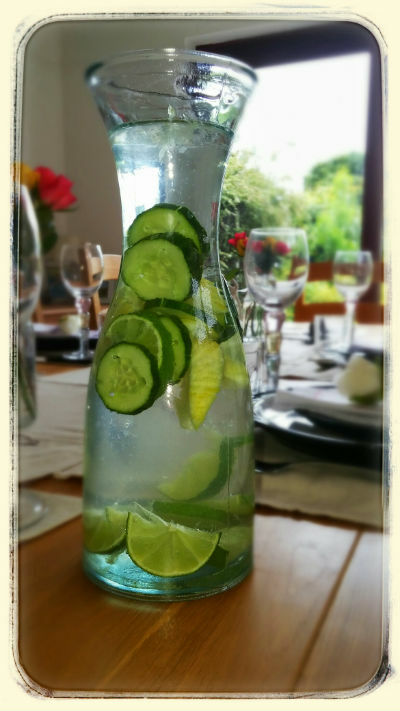 The accent colour in our kitchen is duck egg blue, so it looks so good on the window sill when we’re not using it, but it has been put to good use on many occasions – I’ve tried out a few of my “fancy water” concoctions in it! 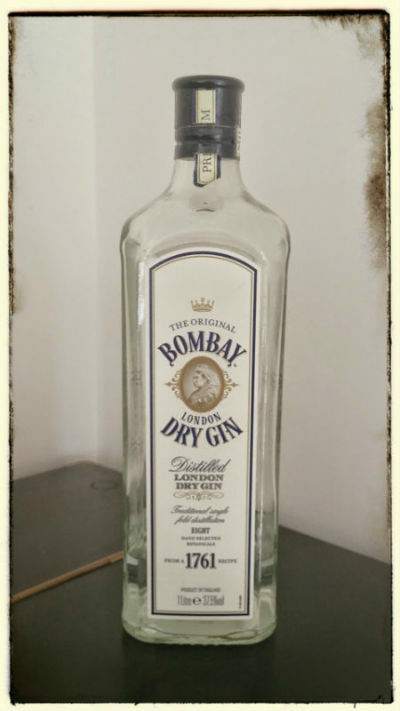 Until recently, Bombay Sapphire was definitely up there as one of our favourite gins, but this has now been usurped by Bombay Original, which was first introduced in 1959 (although based on a recipe from 1761) and is actually the precursor of Bombay Sapphire. We definitely feel that this makes the better tasting gin and tonic, being full of intense, aromatic flavours yet seemingly smoother on the palate. Delicious! This is most definitely my favourite nail polish right now! Rimmel London 60 Seconds Super Shine Rita Ora Summer Shades Nail Polish in Rain Rain Go Away is a gorgeous grey/brown colour, so goes with just about everything. It goes on and dries very quickly – in fact, it’s possibly the quickest, easiest and neatest nail polish application I’ve ever done. It seems to last extremely well too – it doesn’t chip or fade and stays beautifully shiny for days. In addition to the ten things which have made me happy during the week, which form my Happy Friday posts, I have decided to create a Finding Treasures section, where I will document, once a month, various new products or items which I have found and love. 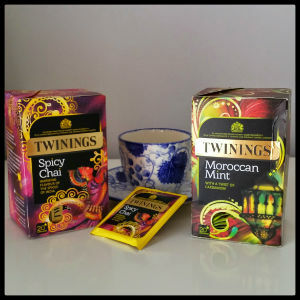 As you know, I love all things tea, and this month I have tried two new teas from Twinings – Spicy Chai and Moroccan Mint. I have developed a huge love of chai tea over the past couple of months (how I hadn’t tried it before is just ridiculous! ), and this Spicy Chai does not disappoint. Chai tea started in India, by infusing spices and tea leaves in milk and I do love to add a dash of milk to this one. You can really taste the spices – cinnamon, ginger and cardamom – alongside familiar tea, without it being too strong, so it has become my favourite. D is still to be convinced about this one, but he does love the Moroccan Mint. Since he went to Marrakech a couple of years ago, we have been on the look out for a really good mint tea, as he apparently sampled some truly delicious local variety. I think that this is the closest we have come so far. Sadly we don’t serve it from intricate silver teapots into beautiful glass cups, as would be the way in Morocco, but it’s still pretty good. This again has a slight taste of cardamom, which seems to be incredibly popular right now, even appearing in toiletries – luckily I love the taste. One more point about these teas – just look at the packaging! I love the colours and designs used on the boxes, so these haven’t been decanted into my tea organiser – they’re staying right where they are! 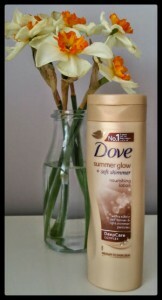 Dove Summer Glow + Soft Shimmer Nourishing Lotion. Now, when I bought this, I completely didn’t see the “Soft Shimmer” words, so it was quite a surprise when I noticed my skin sparkling with what looked like tiny, tiny pieces of glitter! However, now that I have used it a number of times, this does not seem noticeable – and you had to be very close up to notice it in the first place. 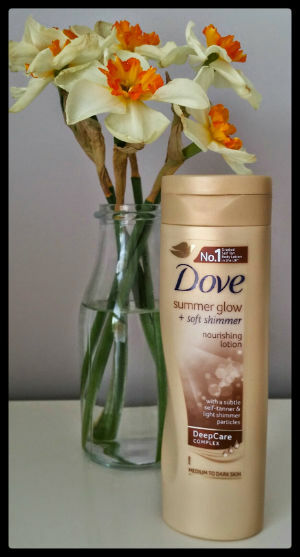 As it is a body lotion, it is easy to apply and is very soothing to the skin, and gives a far more natural sun-kissed look to my skin than other stronger self-tanning products. Sales of fake tan products are apparently down by 19%, as people are trying to avoid the TOWIE look (understandably! ), so this product is perfect, as it gives a natural glow, which makes me feel happier to show my otherwise very pale skin. The added bonus is that it doesn’t have that familiar fake tan smell – it actually smells really lovely! 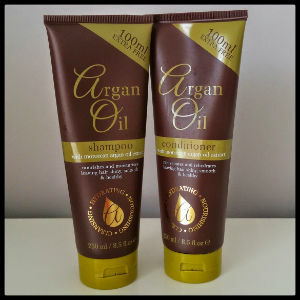 Argan Oil Shampoo and Conditioner. I haven’t completely missed out on the benefits of argan oil (from the Moroccan argan tree), which has been very popular for the past few years. I have previously used an argan oil treatment for my hair, but have recently started using argan oil shampoo and conditioner, and I’m loving them. Because I colour my hair, it can sometimes be a little dry, but I’m finding that using these products is helping to restore its softness, strength and shine. I also love using both the shampoo and conditioner, as it means that I just use it as normal shampoo, so without adding an extra step into my routine or having to think about using the correct quantity of argan oil. 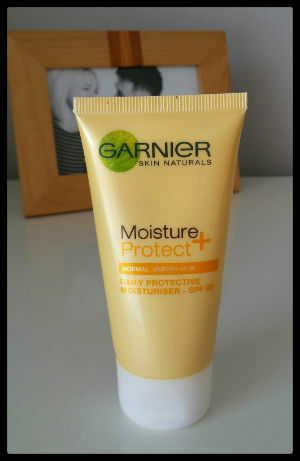 Garnier Skin Naturals Moisture Protect Moisturiser. I picked this up as it was on offer at the supermarket a little while ago, and I’m not loyal to any particular brand of moisturiser, so thought I would give it a go, and I really love it. I don’t wear huge amounts of make up, but I find that this is a lovely base for what I do wear. It goes on very smoothly, and is quite thick, so really feels like it is doing your skin good as you rub it in. I’ve noticed my skin seems to have a more healthy glow to it since using this, and I’m happy that it has a SPF of 20, which is really important. I may need to stock up before it goes off special offer! Navy and white top. I bought this top last week, and absolutely love it! It is quite unusual, as it has a real preppy look to the front, with the white collar over the navy blue jumper, but then the back of it has the navy section at the top, with the majority of it being like a white blouse. It is very comfortable to wear, fits well, and is perfect for this spring weather, as it’s long sleeved but quite thin and light. 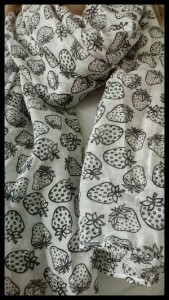 Strawberry scarf. I’ve had my eye on this for a few weeks but only decided to buy it last week – and then couldn’t find it! Fortunately, G was with me and she succeeded in finding one hidden at the back of the rail! I adore it – it’s so pretty, with the strawberries all over it, but in just black and white, which means that it will go with all sorts of outfits. I also love the size – it is a large scarf, which I’m very into at the moment, as they are so comfortable and versatile, and again, great for spring. And as Elizabeth Taylor once said, “Women who don’t wear, scarves have no future”!! Thank you for reading. The forage for May’s treasures will start shortly!